Today's activity has been weeks in the making and I'm so proud to share it today (I even created a little video of our finished product!). I've been posting our progress on Instagram and have gotten a great response from my community! I really wanted Miss M to have a good background knowledge of the alphabet before she starts school, but this doesn't just mean writing out the letters 10 times each. There are so many more hands on and engaging ways to learn letter formation, as well as the sounds and words which begin with each letter. This is a sponsored post as part of my ongoing Brand Ambassadorship with Teach Starter. 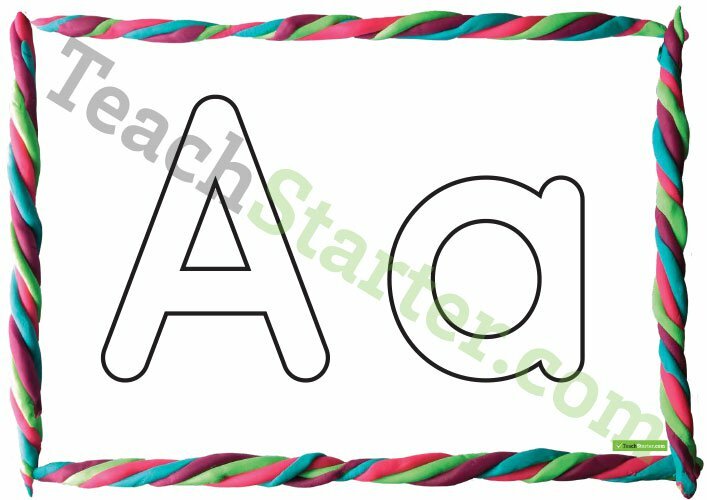 So I found these awesome alphabet play dough mats on Teach Starter, and you could of course laminate them and use them to create each letter with play dough as a fun, sensory experience to learn letter formation. But I decided to find a craft material for each letter for Miss M to decorate each one. Now what about capitals vs lower case? Because this question comes up ALL THE TIME! Parents are wondering, which letter do I teach first? Well, letters are everywhere. It's not like you can shield your child from all capital letters in their environment because you've heard you are supposed to teach lower case first. Their name starts with a capital letter and so do many other key words they are bound to come across. However, from a learning to read and write point of view, it's important for children to know the sound each letter makes (i.e. the lower case letters). So my advice - teach both! Which is exactly what these play dough mat templates do! I tell Miss M that the capital letter is the name of the letter, and the lower case is the sound it makes. "This is the Letter A, and it makes the 'a' sound like in 'apple' or 'ant'." So here it is. Our completed letter of the day craft project. Now we didn't do one per day, we did a few in one sitting, and I also didn't do them in order (in totally depended on what materials I could find in my craft cupboard). But we had SO much fun doing it together and now she has a much better understanding of the alphabet. Z is for zebra stripes! The easiest letters for her to do were stickers or colouring/drawing. Gluing wasn't too difficult either, and I helped her with cutting and pasting. I also thought you could laminate them and use loose parts to create each letter (or play dough of course as they are intended). One final thought - I have in the past done this activity in the classroom. I would select one or two students to complete each letter and it comes together as a fantastic alphabet frieze display for the classroom! What do you think? How else would you use this Teach Starter resource?